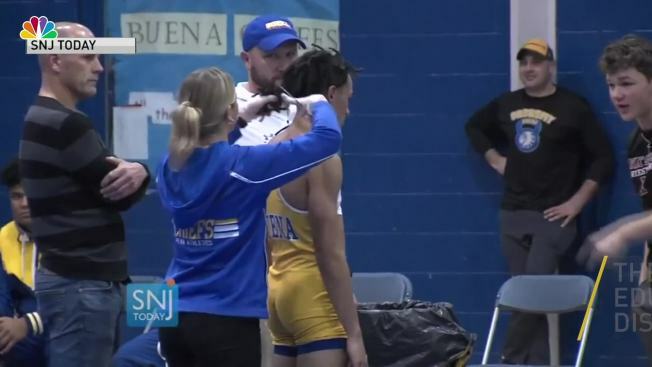 A black New Jersey high school wrestler who was forced by a white referee to cut off his dreadlocks or forfeit his bout will not compete at his school's next match. Buena Regional High School junior Andrew Johnson will not wrestle at the school's Thursday match as officials investigate the haircutting incident that thrust the student, referee, school and others into the national spotlight, announced Dominic A. Speziali, the attorney representing Johnson and his family. On Wednesday evening, the Buena Regional school board convened an emergency meeting because of the backlash to what Johnson went through. The board announced that the district would never again participate in any sporting event at which the referee, Alan Maloney, takes part. Some residents were very angry that Johnson was forced to make such a choice in the midst of a wrestling match. The school board also announced that the high school's wrestling coach and athletic trainer would discuss the incident with board members behind closed doors. But, the board said, the outcome of that discussion would not be made public. An attorney for the Johnson family said the wrestler did not want either of the two school employees fired. A video of Johnson being forced to cut off his dreadlocks in the middle of his high school gym went viral and gained national attention as people rallied around the teen and raised questions about the treatment of young people of color. The video, originally tweeted by a SNJ Today reporter, shows fans and coaches watching as Johnson stands dejected while a trainer uses a pair of scissors to cut off his hair. The crowd cheers as Johnson wins the match - which helped his school to a tournament victory - but despite having his hand raised after the victory the junior stands with his shoulders slumped and head down as he walks off the mat to be comforted by his team. Maloney has been identified by the Courier-Post of Cherry Hill, New Jersey, newspaper as having used a racial slur against a black referee in 2016. Maloney said he did not remember making the comment, but did agree to participate in sensitivity training and an alcohol awareness program after the incident was reported, according to the newspaper. Speziali says that during Johnson's match, the wrestler was told his hair "wasn't in its natural state" and that Maloney called the teen's dreadlocks, "braids." While some criticized Johnson's coaches, he and his family have stood by the coaches and athletic trainer, placing full blame on Maloney. The Johnsons and Speziali say the referee did not raise any issues about the length of the teen's hair or the need to wear a hair covering when he evaluated Johnson before the match. "The blame here rests primarily with the referee and those that permitted him to continue in that role despite clear evidence of what should be a disqualifying race-related transgression," Speziali said. The video drew swift condemnation of the way Johnson was treated and an investigation by the state Division of Civil Rights. New Jersey native Jordan Burroughs, a 2012 Olympic gold medalist and four-time world champion, also voiced his support of Johnson, using Twitter and Instagram to call the incident "nonsense" and a "combination of an abuse of power, racism, and just plain negligence." The American Civil Liberties Union's New Jersey chapter also responded with a tweet asking, "How many different ways will people try to exclude Black people from public life without having to declare their bigotry?" Buena Regional School District Superintendent David C. Cappuccio said the district is also investigating the case and "will continue to support and stand by all of our students and student athletes." For its part, the New Jersey State Interscholastic Athletic Association said it was conducting an investigation into the incident. Michael Cherenson, a spokesman for the NJSIAA, said the organization had reached out to leagues and conferences that assign referees that they have agreed not to assign Maloney to any event until the matter has been reviewed.